Involvement in campus organizations is an important part of the university's total education program. These groups offer social and service opportunities for their members, the university, and the community at large. Membership can broaden acquaintances, develop leadership ability, build decision-making and problem-solving skills, and complement classroom instruction. Part of your involvement on campus includes Blugold Connect - COMING SUMMER - 2019!! Blugold Connect will be the University's online student engagement platform. COMING FALL, 2019 - BLUGOLD CONNECT!! This new online platform will be your one-stop connection to engagement and leadership opportunities at UW-Eau Claire. Every student on campus will have access to Blugold Connect, and as a user, you can explore over 230 clubs, organizations, departments, and programs on campus. This online community will allow users to create events, check-in at events through your mobile phone, manage your student organization, participate in campus elections and much more! Until the new platform is ready, please contact the Activities, Involvement, and Leadership office (220 Davies Center, 715-836-4833) for any questions you might have! 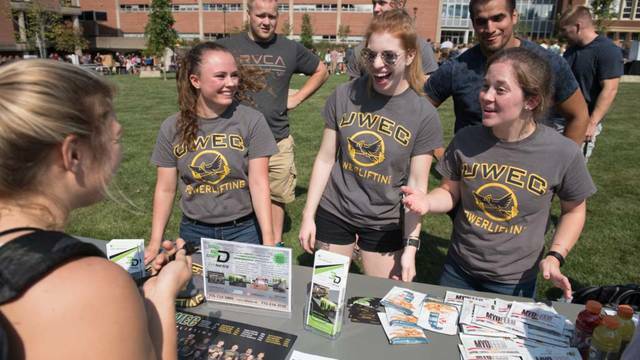 Search clubs and organizations that UWEC has to offer. The Student Organizations and Leadership Center located in Davies Center 220 (second level) provides services and is home base to more than 230 campus organizations. Workshops/conferences for student leaders and advisors are conducted annually; workshops and publications are designed to assist organizational development; and recognition programs are designed to acknowledge the outstanding efforts of individuals and organizations. If you can't find what you are looking for, check out information on how to start a new organization.